For those who watched Pope Francis' first papal mass, you witnessed a man who was truly humbled by everything that has happened in the last two days. Sure, I could talk about my dislike of the revival of the free standing altar back into the Sistine Chapel and many other liturgical things that would typically throw me off. I, however, was deeply moved by the true zeal and passion of Pope Francis as he was giving his sermon and his love of the Eucharist. If you have the chance, I'm sure you can find his first sermon on YouTube. I was moved by a man who was given a task he originally did want (conclave 2005) but was elected to by the College of Cardinals. His soft spoken voice is not a sign of weakness but a sign of humility. Yes, I know he only has one lung. He is not Benedict XVI. He is not Blessed John Paul II. He is Pope Francis, a man of whom we all must get acquainted to and a man of whom the Holy Spirit has made our new Supreme Pontiff. I pray that he will adopt the liturgical tradition of Benedict XVI and keep his zeal for the Catholic faith in his preaching! Sure - the sermon was in Italian and not Latin. The mass was in Latin. Sure, the vestments weren't what I would call "traditional". Sure, the mass was celebrated versus populum in the Sistine Chapel and not ad orientem like Benedict XVI would have done so. All of this set aside, we have here a man who is humble, gentle, traditional, and on fire for Christ's Bride, Holy Mother Church. We have a man who has combated evil itself in Argentina. I ask that all traditionalists out there who began to slander our new Holy Father eat a slice "humble pie" (don't worry - I'll have a slice. I may not have shared my opinions publicly, however, I dare say that I was thinking some of what was being said. I did, however, raise question on Dr. Taylor Marshall's blog Canterbury Tales about the past forms of the now Pope Francis' form of ecumenism) and get back to work in promulgating the New Evangelization and saving our ever more increasingly secularized culture! Let us pray for our new Supreme Pontiff, Francis. 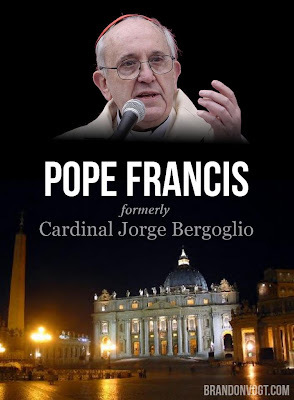 We, at Maniples Matter, would like to congratulate the former Cardinal Jorge Bergoglio, now Pope Francis, on accepting the position ordained by the Holy Spirit to be the Supreme Pontiff of Christ's One, Holy, Catholic and Apostolic Church. We pray that he continues the liturgical continuity of Pope Emeritus, Benedict XVI, and pray that he brings back the sacred into the Church's liturgy! 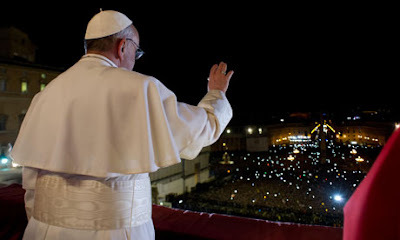 We pray that Pope Francis upholds the dignity of Christ's Church, prays that he will be graced with countless graces by the Holy Spirit, and guide the Church, through the New Evangelization, into a more authentically Catholic, spiritually and liturgically, so as to share the faith to the secular world. Before I converted to the Catholic Church, I was a ardent Anglo-Catholic and a passionate traditional liturgist (huge surprise to you all, I'm sure...). I came across a copy of Ritual Notes, 10th Edition while I was still in high school and devoured every page. It is the traditional liturgist's bible, whether Catholic or Anglican, and speaks on behalf of the Oxford Movement within England during the later part of the 19th century (the same movement that Blessed John Henry Cardinal Newman was a part of and became a Catholic through). Why do I bring this up? Well, after I graduated high school, I left my copy of Ritual Notes, 10th Edition, at the parish that I attended. Becoming even more of a liturgist in college, I yearned for this book! In the last week, I have been able to obtain it again and have not placed it down! It is literally a "liturigst's drug"!!! The Ritual Notes, 10th Edition, takes the best of the Sarum Rite (Salisbury Use, 14th c.) and the Tridentine Rite (commonly called the Traditional Latin Mass) and combines them into a traditional, Anglo-philed, liturgist's dream! Lastly, if the UK, USA, and Australian Personal Ordinariates adopted the Sarum Rite (with the use of Latin, not just the pageantry), I'm sure that could be the substitute for the Tridentine Rite that seems to have been forbidden for public worship on Ordinariate property at least in the United States. Mgsr. Steenson has stated his reasons, however, I think the Sarum Rite is a perfect replacement! It's English; it's traditional liturgy; it's Latin, and it helped inspire the liturgy of the Oxford Movement! 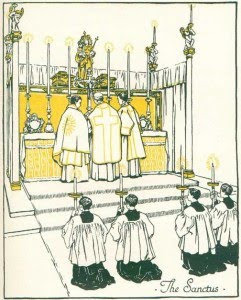 Picture taken from an Anglo-Catholic source published in England in the first part of the 20th century depicting the "English Use" (Anglican), which can be assumed to be the Sarum Rite in English.